The cost of becoming a private pilot can vary greatly, and everyone wants to know how to get the most bang for their buck. While “cheap” is rarely an option when it comes to aviation, there are still ways to minimize the cost of obtaining a pilot certificate while maximizing the value. First things first: Never choose a flight school just because of the cost. As with everything, you always get what you pay for, so at a minimum, you'll want to do your research first and make sure you choose a safe, professional flight school. Choose your instructor wisely. A poor choice of instructor can mean an incredibly frustrating – and expensive – flight training experience. Choose an instructor that uses a syllabus and training course outline in order to maximize your time in the airplane and continue moving forward. A training outline will ensure that both you and your instructor are on the same page each lesson, and will alleviate any ambiguity that occurs when you show up expecting to move on to new material and your instructor wants to revisit old material. Make sure the flight school you choose has instructors and airplanes available for you to fly as often as you’d like. If you want to fly two to three times per week, make sure you are able to schedule the airplane that often without having to fight for it. If your flight school has one airplane and a waiting list of students, you might want to look elsewhere. Fly often. Two to three times per week is ideal. More than that and you could get burned out (although many students fly five days a week and succeed without a problem.) Less than that, and you may forget what you learned. Muscle memory early in training doesn’t last long, and if you wait a week or longer in between flights, you might find that you’ll have to go back and review procedures or maneuvers again to remain proficient. If you can’t fly that often, don’t be discouraged. Many experienced pilots who don’t fly often will frequently find themselves having to relearn maneuvers and procedures, too. Proficiency is just part of the deal when you become a pilot, and you can count on putting effort and time into remaining proficient even after your successful checkride. Use a simulator. I can’t stress the value of a simulator enough. It’s cheap, quicker than flying and safer than flying. You can practice emergency procedures comfortably and safely, and for less money than you can in a real airplane. In a simulator, your instructor can pause the simulator to provide feedback during the lesson, he can add wind or clouds, and he can preposition your aircraft anywhere he wants. This means that instead of making you fly an entire long cross country route, just to see that you know your navigation procedures, your instructor can save time by moving past the more monotonous phases of flight and placing you exactly where you need to be. Take advantage of discounts and freebies. Many flight schools will offer a discount for the prepayment of a certain number of hours, and others will offer free ground school nights or safety seminars. Take advantage of what you can get for free. Show up – even when the weather isn’t good. If the weather looks too poor to take a scheduled flight, don’t just stay home. Show up at the airport and ask your instructor what else you might be able to do from the ground. Maybe you can get in a ground lesson or use the simulator instead, or maybe the weather will clear up, and you’ll have time to fly after all. The same goes for an instructor absence. If your instructor has to cancel, you can always ask if there is another instructor available to go so that you can continue to progress. A steady, continuous progression is key for success. 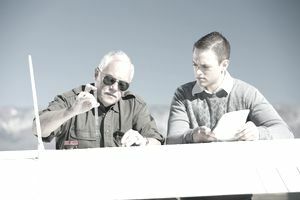 If you take measures to ensure that you fly often with a good instructor, and you work to maximize the use of your time and resources, you'll be sure to get the most value for your money.